In Part I of this article readers were introduced to the concept that strength = speed. Specifically, football players wishing to decrease their 40 yard dash time were told to focus on strengthening their lower back, hamstring and VMO muscles (teardrop muscle found on the inside of the quadriceps). Part I reviewed the best exercises for strengthening lower back and hamstring muscles, so let’s move on to the top three exercises for developing VMO strength: squats with chains, wobble board split squats and sled dragging. 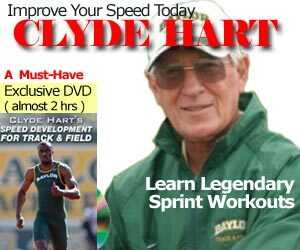 If you improve your speed during the first 10 yards of your 40 yard dash then half your battle is over. In the first 10 yards, it’s all about quads and glutes so choose exercises that specifically work these muscle groups. SST suggests squats with chains. When SST says “squats”, we don’t mean those quarter or 90 degree squats that most trainers advocate, we mean good old-fashioned rock bottom squats. Why? It’s simple; rock bottom squats do a better job of developing glutes and quads (especially the VMO). To further increase the effectiveness of the squat, SST has their athletes perform squats with chains. During a squat an athlete is strongest in the top position and weakest at the bottom. By using chains, SST compensates for the strength curve by matching weight to strength levels. For example, say you’re squatting 300lbs plus 50lbs of chains. At the top, when you are your strongest, the chains are hanging so you are lifting 350lbs. As you squat down and your strength level decreases, you are only lifting 300lbs because the chains are resting on the ground. Description: Start with chest out and lower back arched. Begin to drop hips to ground by first bending knees as far forward as possible and then lowering hips until hamstrings cover calves. Pause for 1 second at bottom. Lift up through legs while maintaining arched back. Feet must remain flat on the ground at all times. You’re probably thinking “What the heck is a split squat”. Split squats are a lunge without the explosiveness. What’s a wobbleboard? Imagine a small board with a hard ball stuck under it (it’s not exactly that, but you get the idea). By performing split squats on a wobbleboard you are training your leg muscles from the hip joint down in an unstable environment. Destabilizing your leg muscles ensures that your VMO gets blasted…in a good way of course. It also allows you to recruit more leg muscles than you would have had you been training in stable environment. Description: Starting position: place foot of non-dominant leg on wobbleboard. With chest out and shoulders back, move hips forward and downward while remaining upright. Allow the front knee to travel over toe of front foot until hamstring is covering the calf. Pause for a second then push off heel of front foot back to starting position. Repeat. The challenge is to keep the sides of the wobbleboard from touching the ground. Sled dragging is a great way to increase functional strength if you don’t have a weightroom facility at your disposal. Mind you, SST does not advocate running with a sled behind you because it will alter your running form. The various sled exercises used by SST for speed training are too numerous to list in the article, thus we will focus on two of our most popular: walking backwards on the balls of your feet and walking lunges. Description: Walking Backwards – fasten harness around waist. Keep chest over feet. Maintain arched back. Bend hips and knees. Begin by taking slow, deliberate steps backwards. Move arms in a running motion. Word to the wise, this exercise will feel really easy for the first ten yards but by the time you reach forty yards, your quads (especially your VMO) will be screaming. Once you are able to cover 100 yds with ease slowly add weight to the sled. Walking Lunges – fasten belt around waste and attach rope from harness to belt. With sled dragging behind, perform a lunge with front leg. Upon landing explode upwards and out. Do not just pop up, the key is to push up and forward. Coaching Tips: keep your front heel down, maintain an upright posture and EXPLODE!